Both supporters and opponents of constitutional changes offered by Morocco’s king have protested in their thousands, indicating debate over the country’s future sparked by the “Arab Spring” uprisings has not ended. Sunday’s opposition protests organised by the youth-based February 20 Movement took place in three cities and passed off without any clashes. 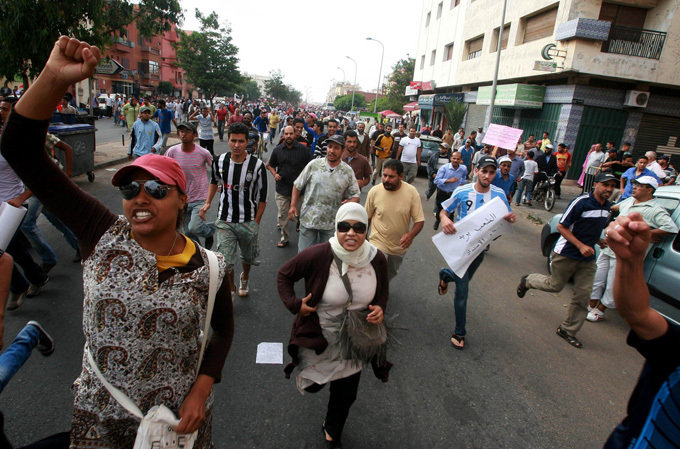 The movement is a loose national network that was inspired by uprisings in Tunisia and Egypt. The biggest show of strength by the opposition was in the northern city of Tangier where witnesses said about 12,000 marched to press the 47-year-old king for deeper reforms. King Mohammed, a staunch ally of the West, is expected to hand over some of his powers to elected officials under a new constitution, which was approved in a referendum earlier this month. But he will still retain a say over strategic decisions. Led by dozens of Muslim clerics and students of Islamic schools, the backers of the reform chanted “We have one king, Mohammed VI!” Two of the students said they were bussed to Rabat from the southern Souss region especially for the protest. Abdelkabir Belto, 19. “The local authorities brought buses for all the pupils of religious schools in Souss,”he said. The February 20 movement has not garnered the kind of support that overthrew longstanding leaders elsewhere in the Arab world, in part because the king is respected by most Moroccans, but it has generated Morocco’s biggest anti-establishment protests in decades.